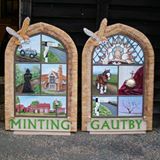 Because both villages are in the same parish, the overall designs of the village signs are the same, with the barn owl and the fingerposts being common elements. The window frame is based on a drawing by Mel Harris of the old Methodist Chapel window, in Chapel Lane, Minting. The stained glass window is taken from that of All Saints’ Church, Gautby, the shire horse represents the agricultural history and the current popularity of shire horses in the village; the orb is part of the Crown Jewels and was commissioned by the Vyner family, whose descendants owned Gautby Hall and much of Lincolnshire. 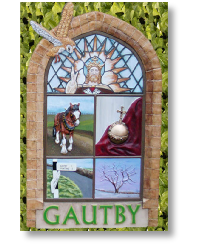 The oak tree can be found at the entrance to what was Gautby Great Park. 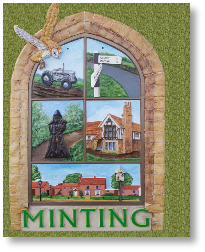 The Benedictine monk represents the long-gone Minting Priory (now an ancient scheduled monument), the vintage tractor represents our agricultural history, the Tudor building – the lost buildings of Minting, particularly that of the Monson family who lived here and finally there is a picture of the Sebastopol Inn, before the current owners took over.